Scheduling irrigation is about planning when and how much water to apply to a crop to achieve crop production or a particular quality. The principles of scheduling water apply to all crops, however the critical timing, methods and techniques can vary with the crop. Chapter 9: Do you need a calibrated probe? 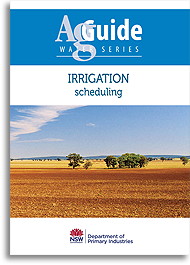 Published in 2015, Irrigation: scheduling is the third book in the AgGuide water series. It contains 66 full-colour A4 pages.